The flavour of Apple Ashmeads Kernel is quite distinctive and unlike any other apple variety. The taste is akin to pear drops and Ashmeads Kernel is regularly used for juicing and ciders. The apples have crisp yellow flesh and green/yellow, red flushed skin. Whilst they are not considered the best looking apples, the flavour more than makes up for this. Ashmeads Kernel apples will be ready for cropping in mid October and the apples have a long keeping period. It requires a pollination partner in group A, B or C to be within a half mile radius. 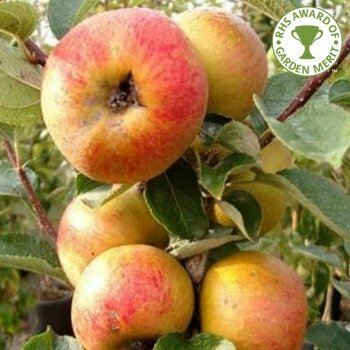 Ashmeads Kernel is a group B apple tree and requires a suitable pollination partner within a half mile radius. Apple trees should be spaced according to their rootstock, for example an MM106 (semi-vigorous) rootstock will require approx. 4.5 metres between trees, whereas an M27 (very dwarf) rootstock will require approx. 1.5 metres between trees.